The name orangutan means ‘person of the forest’. They are easily recognised by their reddish brown hair, big body, long arms and short legs. Males can weigh up to 118kg and their arm span can reach up to 6.6ft! They are one of the most intelligent primates and can live for over 30 years. They like to spend most of their time in trees, and fruit is a staple part of their diet. Destruction of their habitat and hunting is a major cause of this endangered species decline. Forest fires, logging and palm oil plantations are also contributing factors to their endangerment. The plantations play a major problem due to vast amounts of jungle being destroyed to build on. Palm oil is used in an abundance of products from cooking to cosmetics. You can do your bit to help the plight of these beautiful creatures by looking out for products that do not use palm oil. At the Sepilok Orangutan Rehabilitation Centre on the edge of the Kabili-Sepilok forest reserve in Sabah, Borneo you can really get up close and personal with these magnificent creatures. Set up in 1964 to help orphaned orangutans this sanctuary is one of only four in the world. 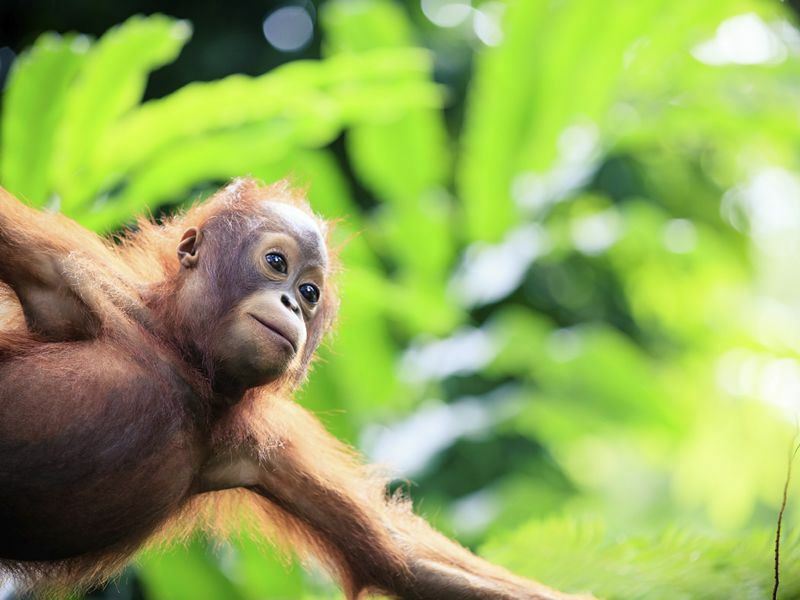 Up to eighty rehabilitated orangutans live in the forty-three square kilometers of the reserve and around twenty-five orphans are currently at the rehab centre, with very young orphans needing round the clock care. Rehabilitation can take up to seven years. While at the centre orphans are given substitute mothers to help teach them vital skills such as climbing and foraging. The food given to them is bland and boring, a tactic designed to encourage them to find for food themselves. When they are old enough and have gained all the valuable skills needed to survive by themselves they are released into the reserve. They still come back for the occasional snack though and this is the best time to visit. Feeding times are at 10am and 3pm and can be witnessed at feeding platforms. Approached through the jungle via a wooden walkway, here you can observe the orangutans in their natural habitat. Although you are not allowed to touch them, this is for their benefit so that they do not become too familiar with human contact. Entry into the centre is 30RM, which is about £6 and allows you to attend both of the feedings. The opening hours are 9am – 4pm so you can stick around all day. There is a short film about the centre’s work, which is well worth a watch and lots of walks around the reserve. Another great way to spend time at the centre is through a volunteering scheme. This is a once in a lifetime experience and participants have the opportunity to work alongside keepers. Helping to care for the orphans by improving living conditions, encouraging and teaching natural behaviour, helping with feeding and giving medical attention are just a few of the satisfying jobs you will get to do on this programme. What a great way to help support and really get to know these endangered gentle giants! To make the most of this wonderful area, stay at the Shangri-La’s Rasa Ria Resort in Kota Kinablu. Right on the beach and with its own nature reserve it is the perfect place to base yourself. Here you can immerse yourself right in jungle action as well as experiencing the beautiful beaches Borneo has to offer.